Boy, have Moshi Moshi Records been churning out quality of late or what? 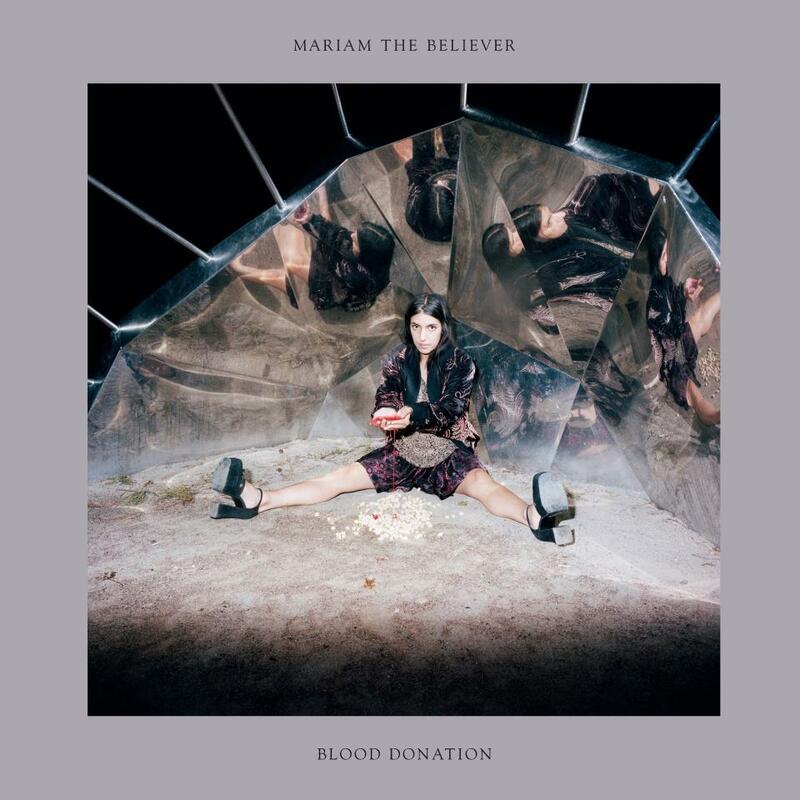 Their latest release is the forthcoming debut album from Mariam The Believer entitled ‘Blood Donation’, and it’s an absolute stunner. Over the past 20-30 years the word “pop” has had a negative association. When we think “pop” we think predictable, formulaic, banal, major label-manufactured shite. ‘Blood Donation’, on the other hand, is a pop record of the highest calibre. The melodies are tuneful but not cliched, the instrumentation is tasteful and varied, and the arrangements are complex but cohesive. ‘Blood Donation’ is a timeless pop record in much the same way as the golden records of the 60’s and 70’s have held up over time. Best known as one half of the critically acclaimed Scandinavian pop duo Wildbirds and Peacedrums, Mariam Wallentin has been reborn as Mariam The Believer. Raised in Sweden by Swedish / Iranian parents, Mariam has “called numbers in smoky bingo halls, travelled the Trans-Siberian railway alone, lived in Beijing, toured Sweden aged 9, married young, lived a nomadic life…..’ and in 2006 formed Wildbirds and Peacedrums with bandmate and future husband Andreas Weliin. The duo have released 3 albums and 2 EP’s to date winning plaudits from the likes of The Guardian and NME. Eager to learn electric guitar Mariam bought a white Gibson in NYC and ‘Blood Donation’ was born. Mariam The Believer’s debut record is at once bewitching and soulful. The record is made up of an array of sounds and its influences are hard to pin down. The record is raw and emotion-fueled – sometimes the dry-recorded vocals crack and distort, yet other times they’re hushed like soft whispers upon the ears. During the first 60 seconds of the opening title track, a Florence and The Machine-like characteristic is summoned with its shared exorcism-through-song / light overcoming darkness quality. Contradictory the song’s verses demonstrate a leveled Fleetwood Mac feel and yet the contrasts blend together seamlessly. An absolute blinder of a track that sets the tone of the record perfectly. The timeless and soulful “Dead Meat” shows accents of Nico meets Nina Simone with its late cleverly arranged quirky 60’s style pop. Both during the opening moments of the aforementioned title track and the short but sweet, “String Patterns” we alsodetect a Jeff Buckley like aura (think “New Year’s Prayer“). The brilliant up-tempo and danceable “Somewhere Else” is sure to be the next single – untreated acoustic drums, quirky organs, and distorted vocal harmonies characterise this number. The chorus of the gorgeous “The String Of Everything” exhibits a Florence and The Machine-esque vocal melody before Mariam transforms into the chanteuse that she is during the song’s timeless verses. The emotion-driven urgency of “Invisible Giving” is a definite album highlight recalling Gossip both vocally and musically in some place and Siouxsie and The Banshees in others. Of the haunting, goth-tinged 7:50 track, the first to be lifted from the album and the first to be written, Mariam says “I tried to make several songs out of it but it wasn’t how it wanted to be played, the different parts in the song structure needed each other to make sense of it somehow. The song is also a bit about that, how small parts in life are linked and together make a way leading to something – that we should not neglect the tiny things in life that may not seem important at first”. A journeying and elaborately arranged tune, try not be captivated by this one. Settling things back down is the sultry and jazzy “Belong or Let Go”, which is made up of a Nina Simone-esque vocal, brushes and upright bass, tastefully coloured with glistening swells. Mariam finds the sweet spot on two of the album’s powerful and ever-soulful interludes, “Blood Patterns” and “Hole Patterns”, whilst during the first 90 seconds of “Above The World”, Mariam’s vocals and lyrics sound like a ritualistic summoning. The moving “All There Is And More” is a stunning old school R&B number and another album highlight. Initially its charms are subtle but around the two-minute mark tension is built courtesy of a stunning and rhythmically complex vocal. Closing track “Love Is Taking Me Over” is a hushed and, again, truly timeless number which gently lowers the listener back onto the ground after such a thrilling roller-coaster ride of moods, emotions, sounds, and colours. What a stunning and accomplished debut record. ‘Blood Donation’ is an absolute tour de force. ‘Blood Donation’ will be released via Moshi Moshi Records on 7 October, 2013.